This is one of three surviving gunner's rules by Humfrey Cole, two of which are in the British Museum (see also Epact 21385). They offer a wide range of applications beyond those of an ordinary folding rule which makes them a valuable instrument in surveying, gunnery and trade. 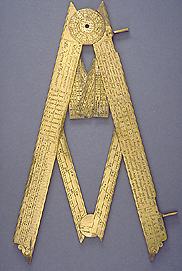 The use of the instrument is best summarized in Cole's own words inscribed on the outside edge of one of the limbs: 'This instrument is a rule a square a peare of Compasses a quadrant to knowe ye howres heights and distances of any thinge ye shotinge of Ordenance to measure'.